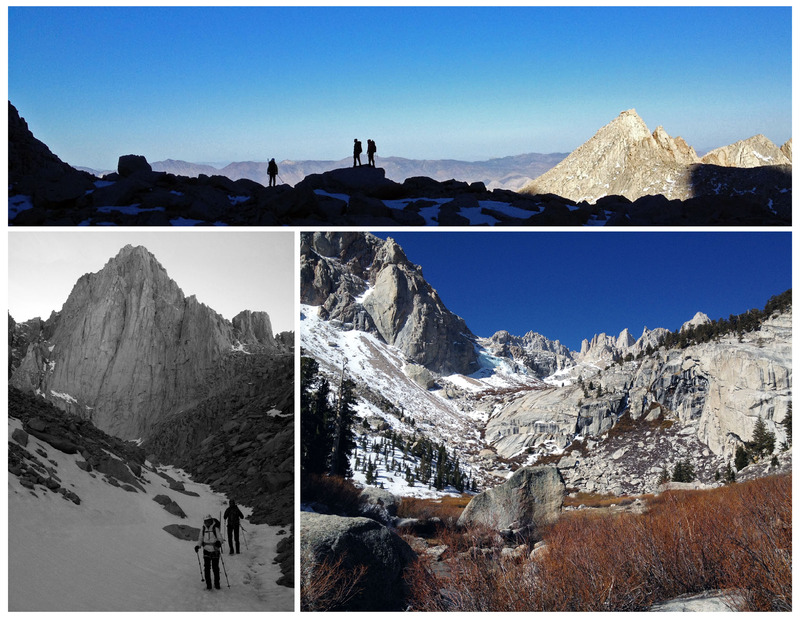 The last 10 days have been an unplugged introspective journey into the Sierra Nevada Mountains of California. The kind of trip where you lose track of time, and days. We drank its water as we climbed its flanks from the surrounding valley to its tallest point. We slept in tents and cooked on fire, forgoing showers for steaming hot springs and digital entertainment for the purest analog experience. Between our arrival and departure dates sat many days free to idle away as we ebbed and flowed with natures sunrises and sunsets. 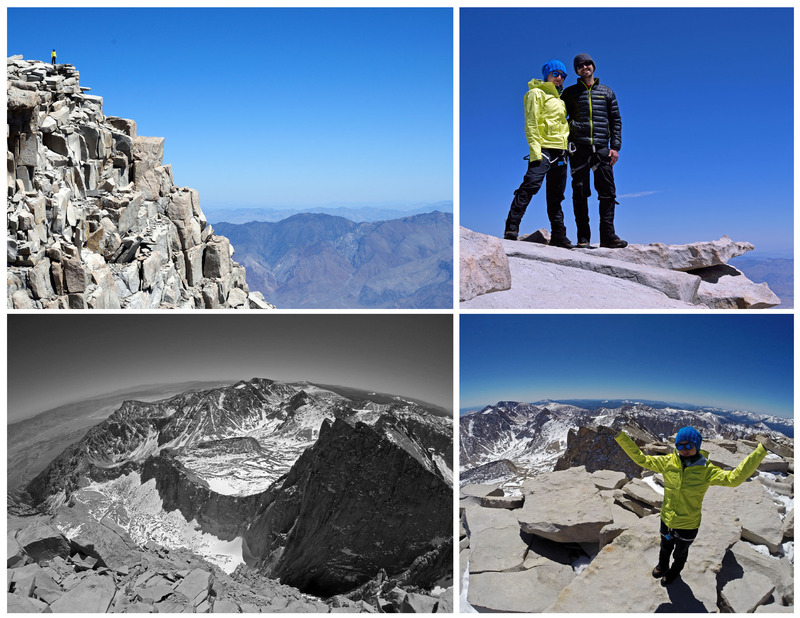 The following is a chronological account of our experience in the Sierra Nevada. The practice of delicately cramming all of our belongings into 65 liter backpacks has become a stimulating ritual as well as a disheartening sign for our cat that we will not be returning in the immediate future. The longer and more varied the trip the more convoluted this process becomes as you try to prepare for all of the things you may encounter. As months of planning become weeks of preparation that turn to minutes of cramming you quickly realize that no amount of stuff can fully prepare you for any situation and a little common sense and a good heart is all that is truly required when stepping into the unknown. We carefully wrapped our bulging bags with 200′ of clear saran wrap and packing tape to keep all of the externally mounted gear fixed to the pack and prevent abrasion to our belongings and threw them in the back of our friends SUV. Moments after groggily stepping into our small airport at 4:30 AM we were promptly informed that they would have to rip off the carefully applied cocoon like wrapper in order to hand inspect the contents of our packs. Fears of our packs showing up at LAX torn open and missing crucial gear (trekking polls, ice ax, pickets, etc…) loomed large but a friendly airport employee who is also a climber assured us that he would take every precaution necessary to have our gear show up intact. 10 hours later and to our relief we watched our packs come down the baggage chute covered in an unfamiliar thick plastic bag and large zip ties. We snatched them up, stepped outside the terminal and jumped into a newly rented Chevy Tahoe with three fine gentleman aboard. Enter Neil, Brad and Drew, all three of which arrived in LA two hours prior and are here on the west coast for their third time in three years having explored the likes of Mt Rainier, Mt Shasta and the Enchantment Range with us on prior visits. Immediately confronted with the hellish LA traffic somehow considered normal down here we pointed the truck North-East to escape the LA sprawl and quickly found ourselves rounding the southern tip of the Sierra Nevada and entering the Owens Valley. Our intentional decision to attempt a late winter ascent meant that we were exempt from the limited permit quota that kicked in on May 1st and a self-serve permit kiosk outside the local ranger station was all it took to satisfy the red tape requirements on our way to find a campsite on the outskirts of Lone Pine, CA as the sun slid behind the silhouette of the Sierra Nevada. Our headlights revealed amoeba like formations as we navigated a sporadic network of dirt roads on a luke warm California evening. These were the Alabama hills, situated at an elevation of 4500’ above sea level and only 4 hours from Los Angeles they became a popular filming location for Hollywood crews to shoot old western and sci-fi movies including portions of The Lone Ranger, Bonanza, How the West was won, Tremors, Joshua Tree, Gladiator, Transformers, Star Trek Generations and over 140 others. We set up camp beneath a looming rock and enjoyed a bonfire dinner of vegetables and sausage cooked to perfection in tinfoil packets. A couple of wanderers parked there retrofitted VW Vanagon near us and stopped over for introductions and storytelling that is at the heart of these chance meetings of alternative minds in unconventional locations. Beer and whiskey marked both the celebration of the successful logistical execution that led us all to this small corner of the country and to lubricate our nerves on the eve of our upcoming climb. 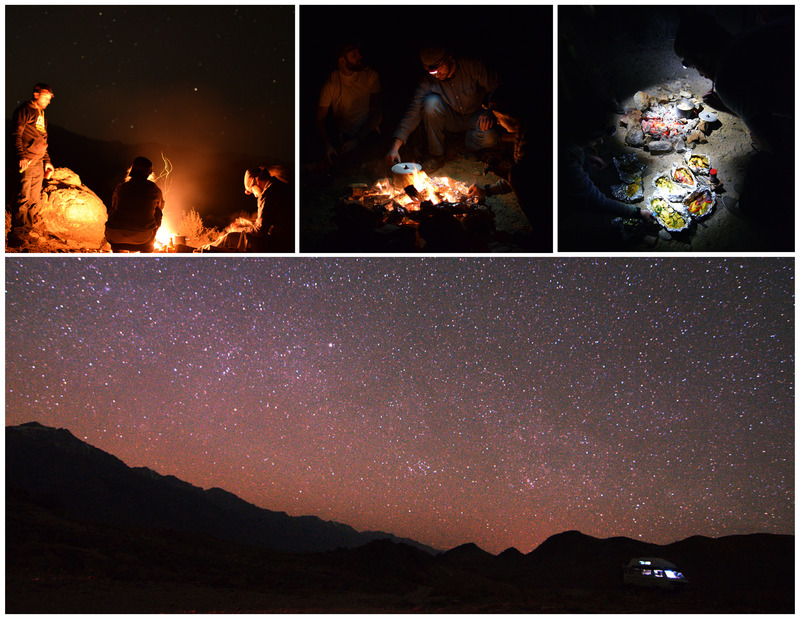 We pitched our tents without rain flies and fell asleep under the dark speckled skies of the Owens valley. The direct sunlight woke us and the strange red hued rock formations now stood in stark contrast to the cold grey Sierra granite. 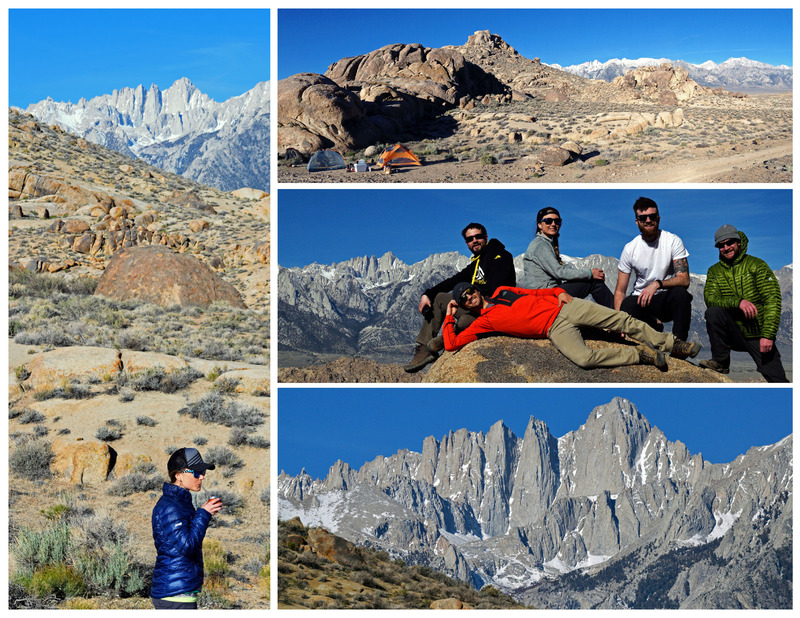 We scrambled up the adjacent rock protrusion and gained access to an expansive vista punctuated by Mt. Whitney tucked away above the drainage valley of the North Fork. We choked down some breakfast, packed up camp and drove the last 11 miles to the Whitney Portal trailhead where a seemingly unimportant ½ hour of last chances and double checks signified the successful transformation from the stage of preparation to the stage of execution. If anyone pretends that carrying 35+ lbs of gear up hill for miles upon miles of steep, uneven terrain is physically enjoyable then they are a liar. This is what our day has in store for us, one foot in front of the other, and while I’ve seen plenty of inexperienced individuals muscling up an objective, these are undoubtedly mental journeys. To subdue the physical discomfort I turn inward and redirect my focus to subtleties of temperature, color, sounds and texture. Delicate interactions with worn rock and bark remind us that we are not the first nor the last humans on this personal pilgrimage that follows in John Muir’s footsteps. 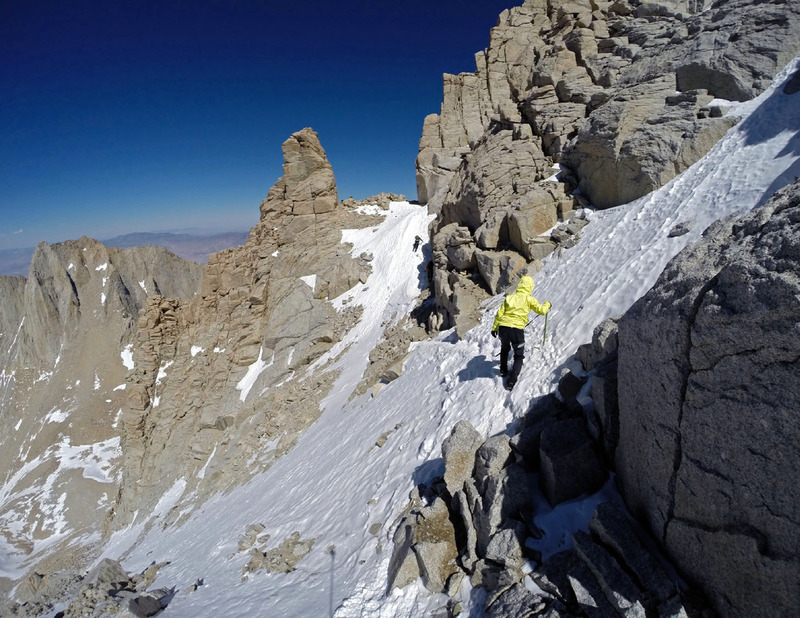 The standard trail to the summit of Mt Whitney is a long 11+ mile slog and we have instead opted for the less traveled and more direct “mountaineers route” that follows the North Fork drainage to the east face couloir and that was first walked by famed naturalist and father of the high sierra, John Muir. The somewhat minimal and often times varied information on this route had one consistent warning; that this was not a maintained trail and way finding would be required. The initial worn use path was easily identifiable as we squeezed up a willow choked valley and climbed out on the north side onto a small granite ledge. An early test of ones comfort in high places comes with this narrow stretch of path known as the Ebersbacher ledges where sure footing and pack width awareness are critical in avoiding the long trip down. With the ledges behind us the late afternoon sunlight wreaked havoc on our pace as we post holed knee deep through a long snow-covered scree field before reaching the sloped granite slabs just below Upper Boy Scout Lake. 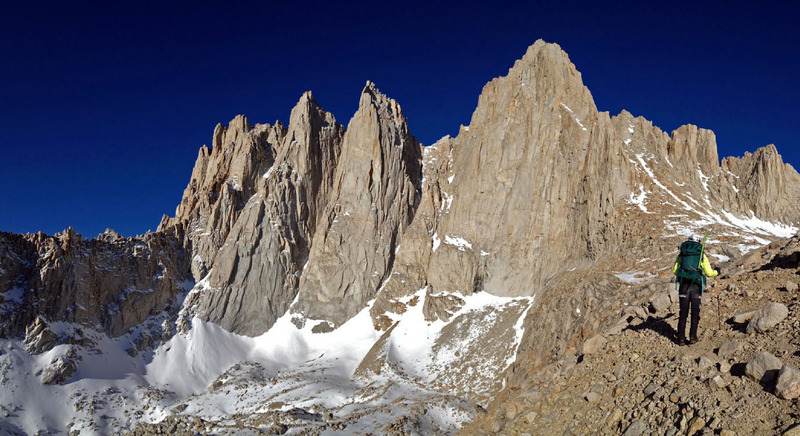 Six hours after leaving the truck we set up camp in the UBSL Basin surrounded by steep walls that kept Mt Whitney just out of sight and instead directed our gaze back down the North Fork drainage that spilled out onto the open valley below. The long shadow of the Whitney massif stretched out over the increasingly discernible town of Lone Pine as the lights flickered on. The swift temperature swing towards and below the freezing level combined with what was to be an “alpine start” the next morning was enough to encourage sleeping bag occupation sooner than later and we fell asleep under eerily calm skies. 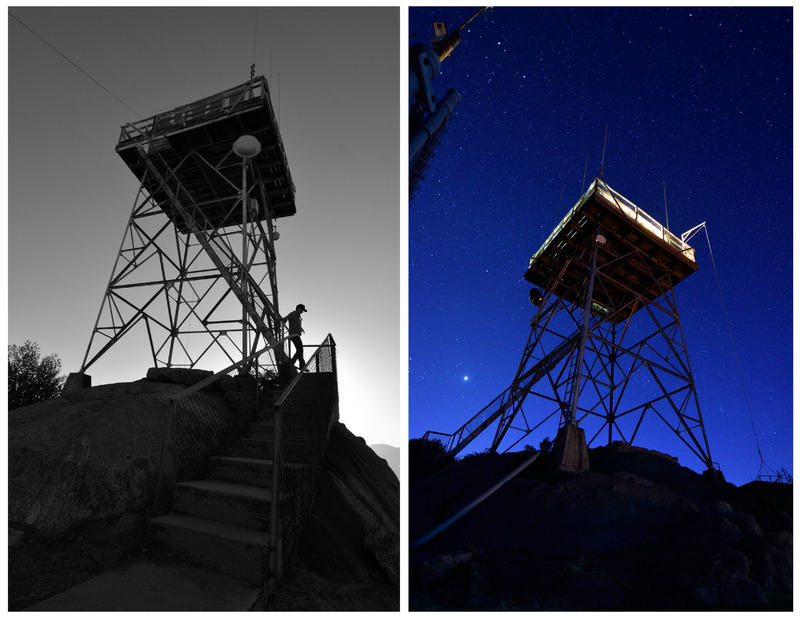 We awoke well before dawn at 11,200′ above sea level to a star speckled sky, just as we had left it the evening prior. Light wind gusts made me reconsider exiting my down sleeping bag and ruffled the slack material of our nylon tent. I guessed the temp to be around 25 degrees. The plan was and always has been simple on a summit morning; dress, eat, go. We methodically forced on our cold boots, harnesses, and gaiters in-between grunts and gasps. We fired up the small cooking stove and shiver from inactivity. Samantha and I strayed from our usual summit morning oatmeal routine to try something new, a freeze dried “breakfast skillet.” As I poured the water into the plastic packaging, following the usual protocol of our freeze dried dinners I noticed an extra line of directions on the packaging that required an actual skillet to cook the eggs. What we should have noticed upon purchase had only now become apparent, far too late to fix and so we shared the displeasure of drinking the disgusting concoction before mounting head lamps and starting off into the dark as a team. Alpine starts make for some of my least favorite yet most sensory intensive hours in the mountains. With vision restricted to the beam of our headlamps, the other senses become acutely aware of our surroundings and a rhythm emerges. The snow and ice crackles under each step as metallic carabineers and miscellaneous gear clank into each other, hanging in wait from our harnesses. The spike of ice axes pierce the refrozen crust and we listen intently for any unusual sounds that may signal rock or ice fall from above. After little more than an hour we have climbed out of the UBSL basin to expose the shear east face of the Whitney massif as it began catching the first rays of new morning light accompanied by a renewed personal energy. 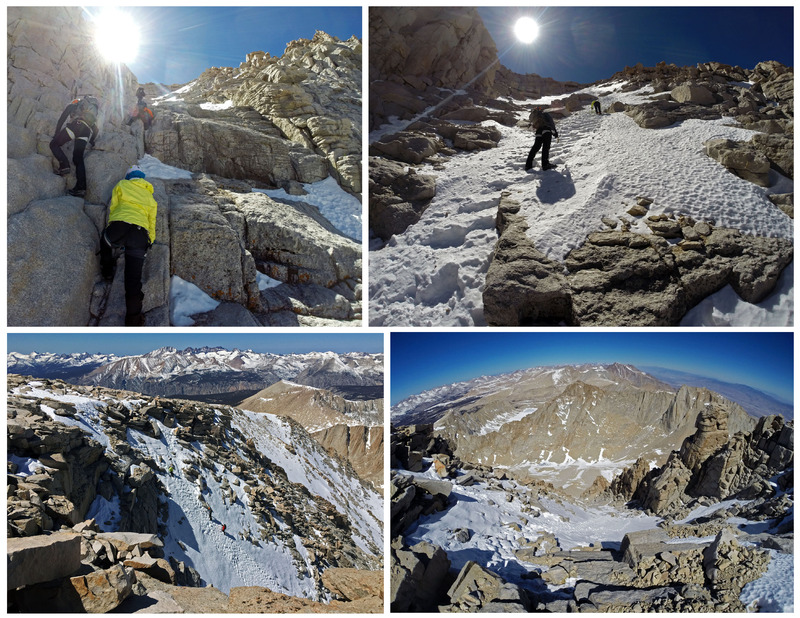 A few exposed upper 3rd class moves on icy granite led to a broad snowfield adjacent to Iceberg Lake and positioned us directly under Mt Whitney’s North-East face and the snow filled couloir that would show us the way to her summit. 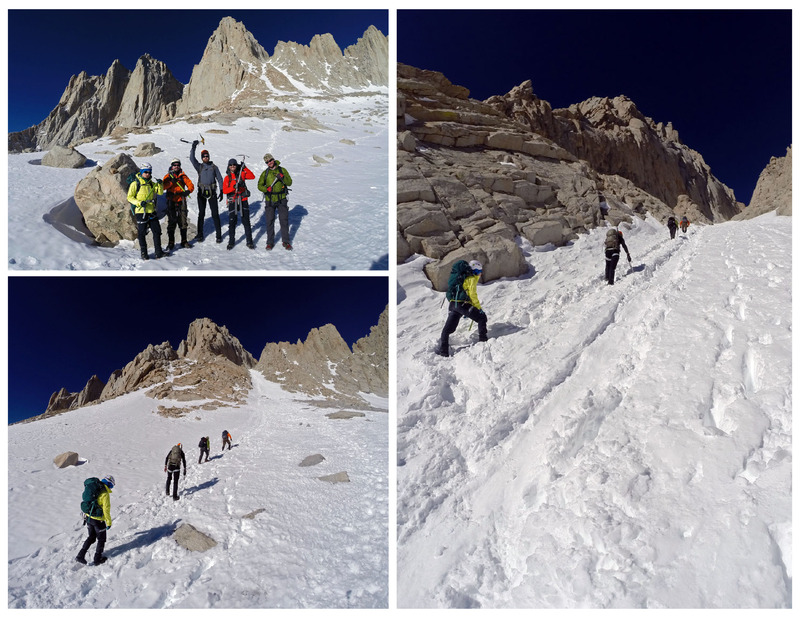 We stashed the trekking polls behind a rock, fastened our crampons and locked into our ice axe leashes before snapping one more group photo and heading up the steep couloir. I had voyeuristically admired this stretch of snow for weeks though a live online webcam mounted over 17 miles away that was used to track and document weather conditions and wondered if others were doing the same at that very moment (http://whitneyzone.com/). The contemplation evaporated when shouts of “rock!” penetrated the air from above. The natural freeze-thaw cycle had dislodged a football sized rock from high on the south wall above the couloir and it was hurtling down the chute. The prompt warning from Brad and Neil gave us sufficient time to step left and allow the rock to careen past us and continue on, presumably to Iceberg Lake over 1500‘ below. The steps grew wearisome as we approach “the notch” at the top of the couloir. Each breath we took provided our bodies with less than half of the amount of oxygen it would deliver at sea level. At this altitude, foreign bodies such as our own, accustomed to life well below 2000’ begin working harder and our blood oxygen saturation likely dips below 85%. We have all monitored our bodies under exertion at this altitude before and a check-in with the group makes it appear as though we’ve avoided the laundry list of illnesses that can begin to creep in. It is the more subtle effects of altitude, however, like a simple fatigue induced misstep that can be most dangerous in circumstances like this. We peer up from the notch at the last and most difficult portion of the climb and are presented with 400 vertical feet of upper class 3 rock intermittently cloaked in a 60+ degree snowfield. Without looking back down at the snow slope that falls away for thousands of feet below, we inch our way up onto the exposed “final 400.” The group’s personal climbing preferences emerge as Brad and Neil opt for a high flanking rock route while Samantha, Drew and I place trust and comfort in our ice tools and head straight up the increasingly steep snow. Our attention to detail was perhaps the highest it has ever been in the mountains, making damn sure every single point on our crampons had gained firm purchase on a stable step before advancing on. A glance left reveals that Brad has completed his final difficult move on the unnervingly steep and exposed ridge of rock before pulling out his camera and snapping a photo of the three of us nearing the summit plateau. Relief comes with shrieks and hollers as one by one we break the crest and transition from the vertical surface to a horizontal plane. 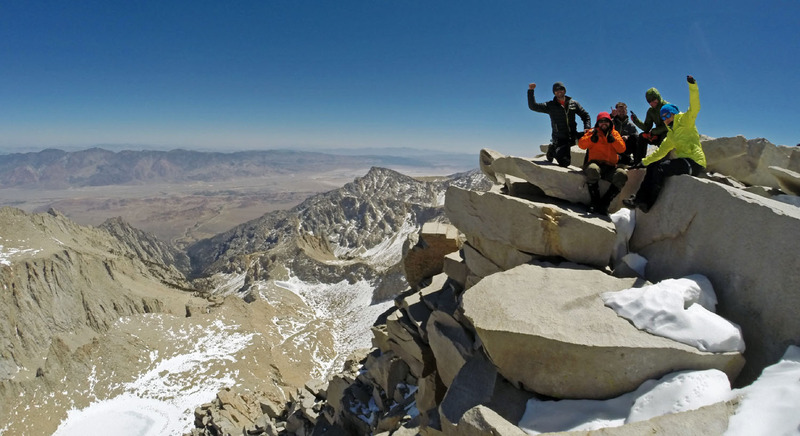 We are standing on the roof of the contiguous United States, over 14,500 feet above sea level. A brief survey finds the summit hut 50 yards away and we meander through the large flat plate boulders that litter the plateau until we are standing at the edge of the iconic east face, flanked by the towering pinnacles of rock to our south. The sky is an intense and uninterrupted cerulean blue the likes of which I have only ever experienced in the mountains, as if our vertical migration peels away layers of smog and ozone to reveal the natures true hues. No tangible entity can capture these subtle revelations, not even a photo. In lieu of the missing summit registry we sign a fraying prayer flag and place it under a stone before laying down on a large sun warmed rock to rest our bodies. 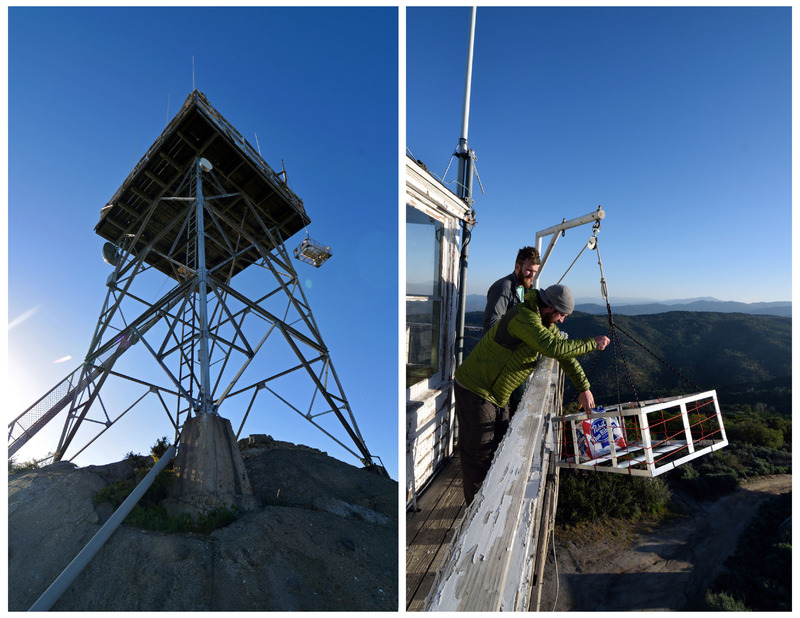 Despite the influx of crowds during summer months, we have the summit to ourselves and idle away an hour or so before turning our focus to the descent after a couple more summit photos. 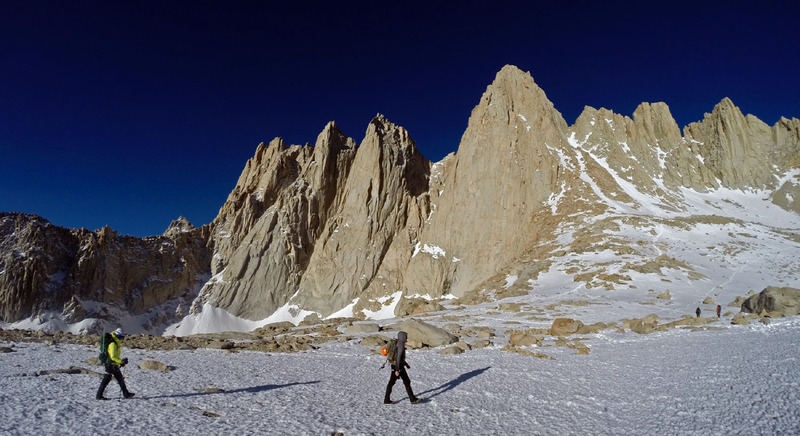 We head towards the west side of the summit in search for an alternate route we had heard about that traverses around the side of Mt Whitney and re-connects with the notch, allowing us to bi-pass the frighteningly steep final 400. In order to drop off the plateau onto the traverse path we used the rope and pickets to set a fixed line that we connect ourselves to using a prusik knot. The prusik knot freely slides along the fixed line until tension is applied (in the case of a fall) at which point it cinches tight on the fixed rope and stops the climber from falling. This is followed by a careful traverse of a boot width path above steep chutes that fall away to the North for thousands of feet. This harrowing “path” leads us back to the notch where we soon learned that our comfortably slow pace throughout the day had consequences. The couloir was now blanketed in the South walls shadow and the surface of the snow was already refreezing. This dashed any chance of quickly glissading or plunge stepping down and the uneven surface of frozen foot prints increased the chance of a misstep or twisted ankle that could send any one of us hurtling down the steep couloir. Using the rope and pickets once again we set up a running fixed line, tied on our prusiks and slowly made our way to the bottom of the couloir while the landscape below became engulfed in the shadow of the Whitney massif and the wind picked up. Brad and Neil continued on at a faster pace with intentions of filtering and heating up water for dinner but found themselves occupied with bigger problems upon arrival. An hour after exiting the couloir Drew, Samantha and I rounded the corner into the UBSL basin to the disheartening site of Samantha and I’s tent upside down in a small brook quit some distance from camp. The intense wind gusts had ripped the tent from its staked foundation and carried it and all of its contents, including excess camera gear, clothes, sleeping bags and pads nearly 100 yards. As we were still 15 minutes above camp, we continued hiking while watching Brad and Neil pluck the tattered orange blob from its new resting spot and return it to camp where they were forced to hang on to it and wrestle with the wind until we arrived back at camp, 13 hours after departing that morning. The natural fears and assumptions hung heavy in the air. The tent had holes, bent poles and the sleeping bags had ice on them. Wet down does not insulate and it was nearing the freezing level as we spoke. Sam and I got inside the tent to act as ballast and begin to inspect the situation more thoroughly. These are the unexpected moments that require mental endurance. There is no time for anger. Giving up is not an option. Critical decisions must be made fast. Options are shouted to one another over the wind as we try to reason as a group. 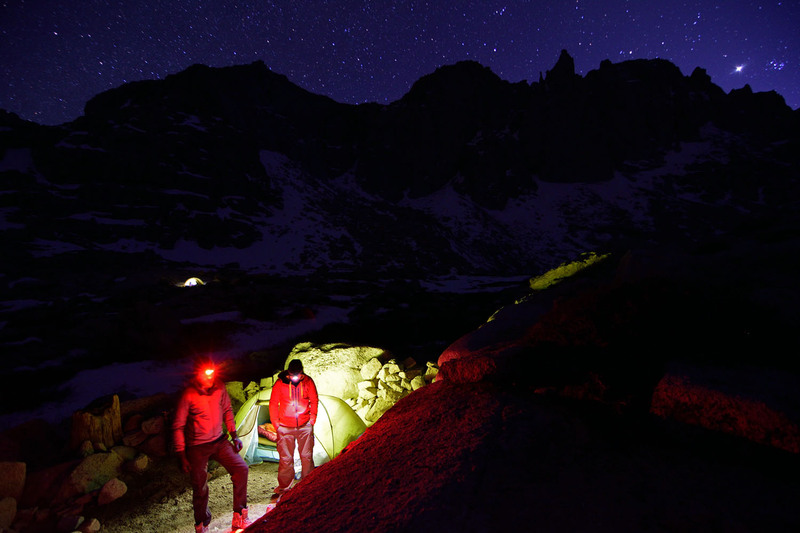 Do we pack up and try to safely conduct 3-5 hours of fatigued hiking in the dark under full pack loads? Do the less weary legs of Brad and Neil set off for the truck with the ruined gear and allow us three to spend the night here in camp in their tents and bags? Is the gear salvageable and able to last another night up here? Drew’s tent has also been battered by the wind and looks like an impromptu wind sock staked to the ground. The bright spots of direct sunlight on our orange tent marked the end of the least enjoyable night I’ve ever spent in a tent. We had been holed up in our miniature nylon compounds for nearly 10 dark hours with wind gusting over 45 miles per hour. Our tent bucked and weaved as variable gusts assaulted every square inch and any slack nylon was transformed into a violent noise maker. I yelled over to the others in-between the still persistent wind gusts to reveal that they too were wide awake. We agreed to be walking away from camp with-in 1 hour and the familiar process of cramming our temporary settlement into backpacks began. 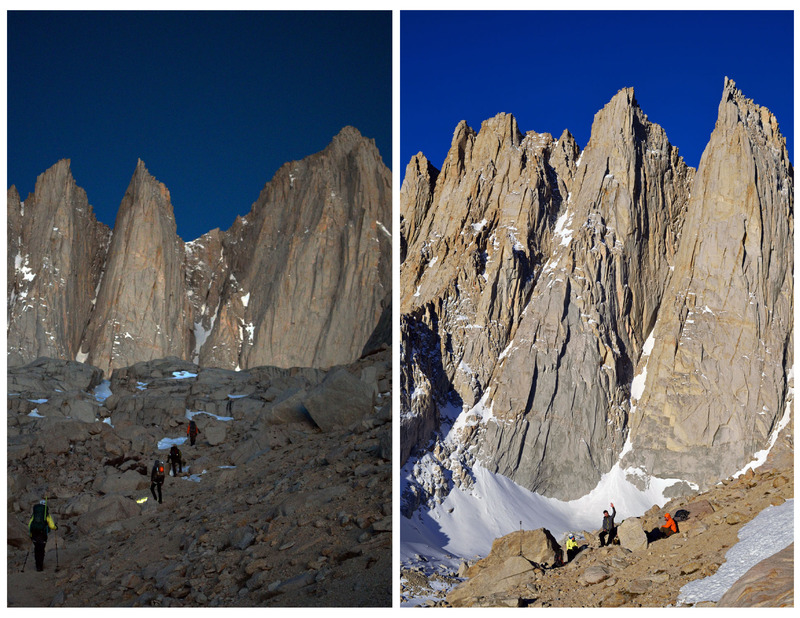 We met our goal and began retracing the route back down the North Fork Valley under another crystal clear sky. We shed layers as the temperature rose the further we descended and the five of us tagged the trailhead three hours after breaking camp. 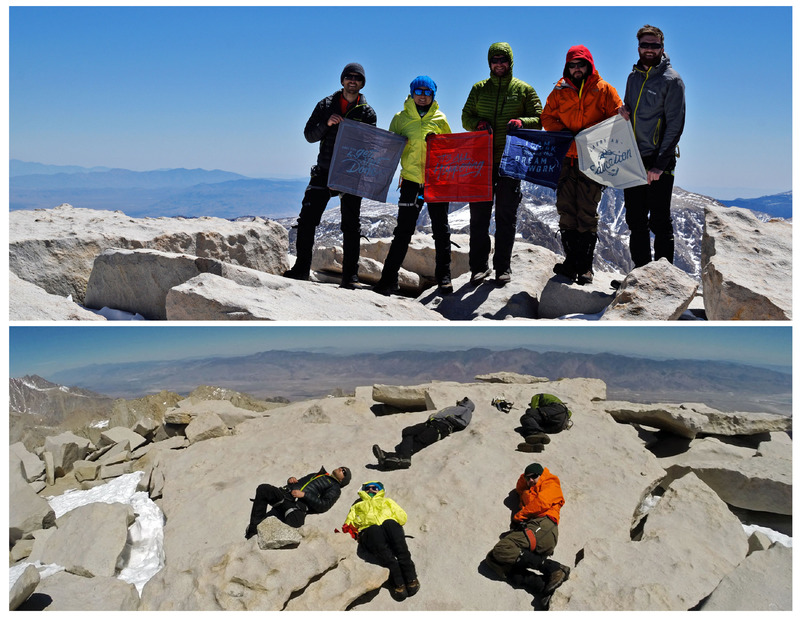 Surprisingly cold beers were dug out of our cheap foam cooler and we solidified a successful trip to the top of Mt Whitney. 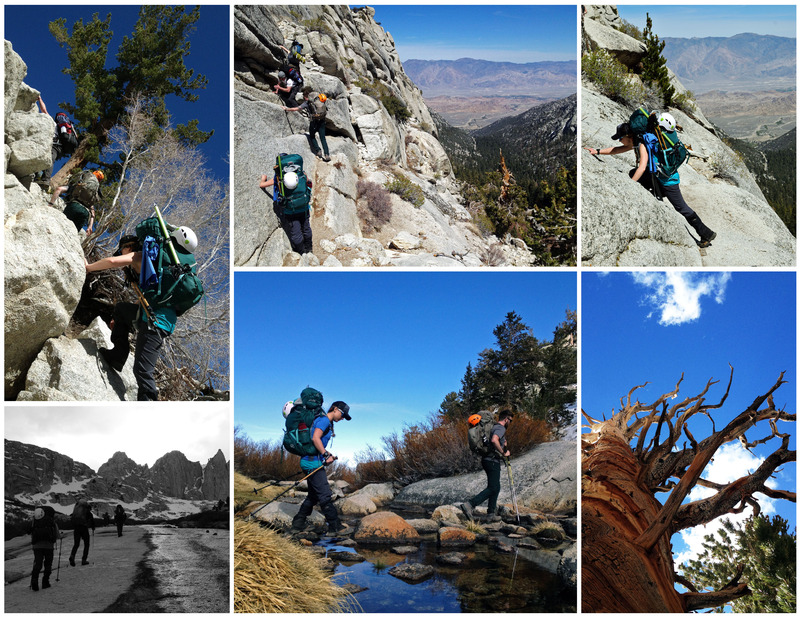 We set off for Lone Pine to fill our stomachs and launder our clothes before heading north in search of natural hot springs to decompress from the stress, strain and elevation of the high sierra. 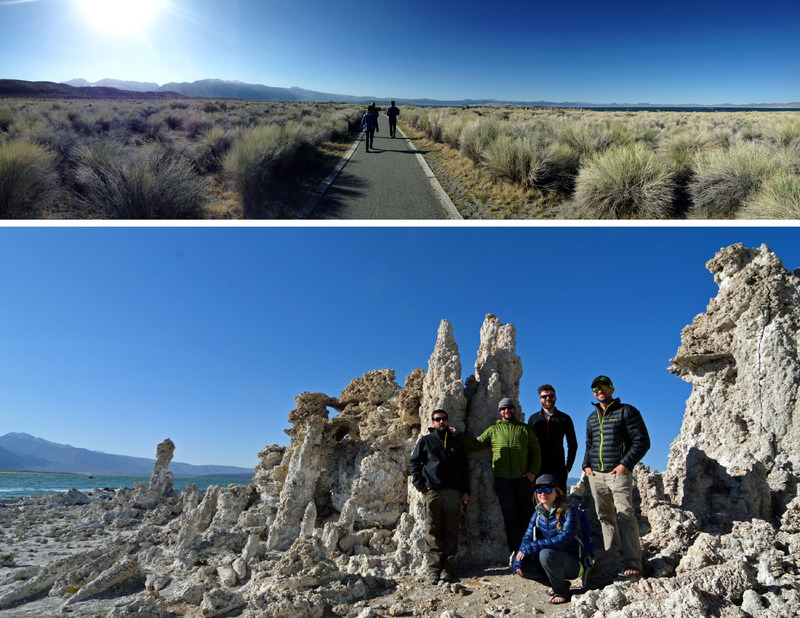 On the way north we stopped on the south shore of mono lake to taste its disgustingly briny water and admire its tufa. Don’t worry, I didn’t know what tufa was either but the stop was educational and enjoyable for all but maybe, Brad, who received a face full of brine foam. Some more time on the road and some written turn by turn directions brought us to a gravel parking lot with a small hand built concrete pool filled with hot water. Choosing to forego the rather uninspiring and already occupied pool, we followed a secondary trough of hot water that exited the source and ran down hill more than a hundred yards on a natural ridge like aqueduct. 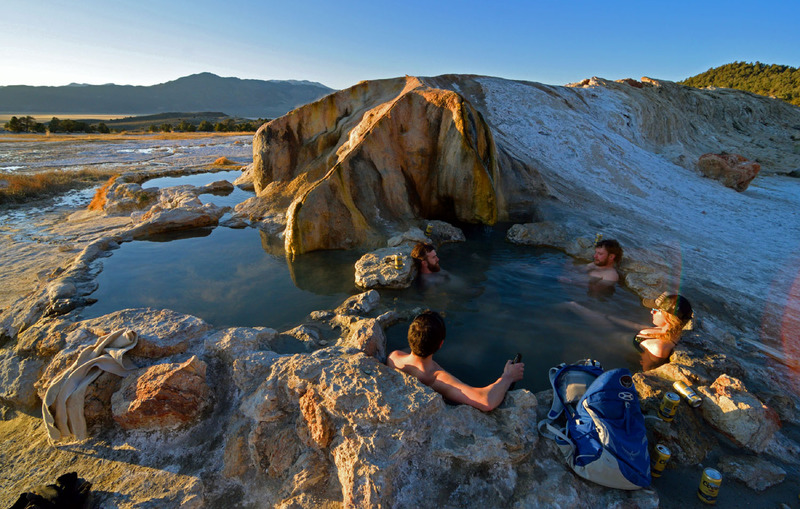 The hot tributary terminated into 4 small pools with views that stretched clear across the open valley to the Sierras. We chose the pool with the hottest water and occupied it until the sun disappeared, enjoying the primal connection to a planet whose molten core had boiled the water we lay in on its surface. Our morning has begun in a nearly inhospitable environment at 11,200 feet, now we relaxed in a naturally heated high desert oasis. 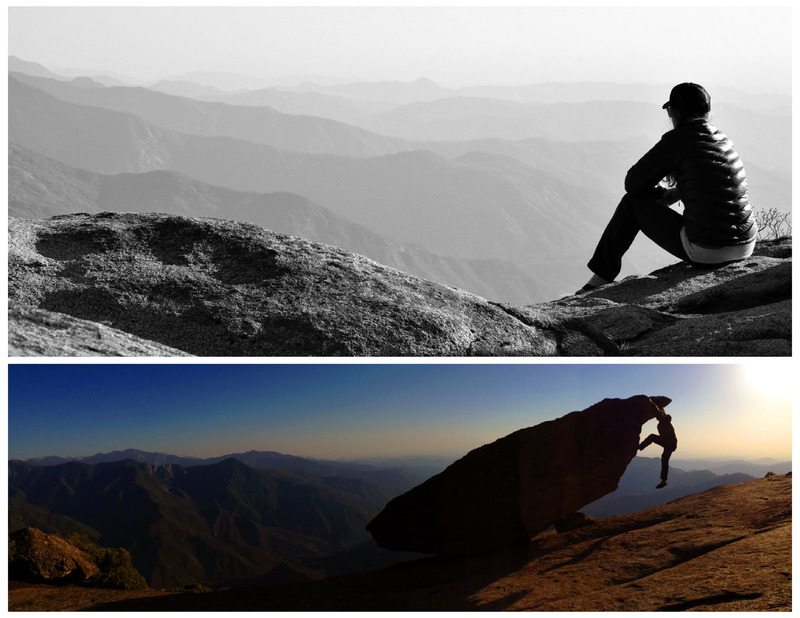 The discomfort of Mt. Whitney had not toughened us and one after another we whimpered out of the hot water into the cold air. We loaded back into the Tahoe for a short drive in the dark and found some flat ground on the edge of a ravine to set up camp. Another bonfire dinner made sure that all of our belongings were thoroughly saturated with wood smoke and we fell asleep to the white noise of the stream below. 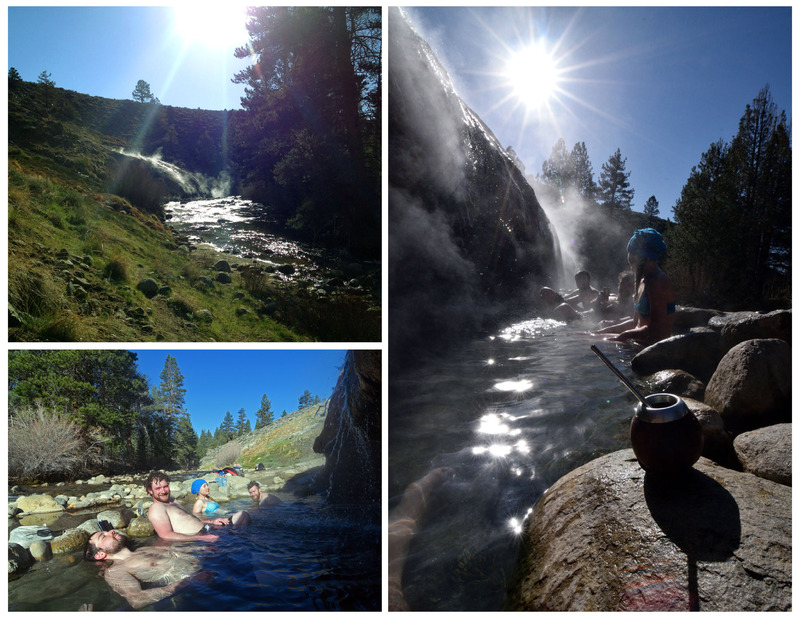 On Wednesday, a morning fire and French press coffee eased us into the chilly air and we decided to set out in search of a nearby hot spring that “the wanderers” had told us about on our first evening in the Sierra. A pleasant path along a crystal clear rock bottom stream led through the woods and into an open grassy slope where steam could be seen in the distance. The hot water source bubbled to the surface somewhere high on the hill side and cascaded down into hand arranged rock pools on the edge of the passing stream. The disastrously low mountain snowpack meant that these stream side pools were spared the spring flood of snow melt that (usually) destroys the pools each year and we enjoyed this small positive bi-product in the shadow of the impending California water crisis. We idled away a portion of the morning under this geothermal waterfall until we felt inspired to move on, reluctantly leaving behind plenty of unexplored hot springs for another visit. Our goal to make it to Yosemite National Park that evening was complicated by winter road closures that made access to the West side park entrance more difficult. We decided to turn the trip into a full circumnavigation of the lower Sierra Nevada and drove north to Lake Tahoe before crossing over and continuing back down the West Side of the mountains. It was at some point along this stretch of driving that a re-evaluation of our “schedule” revealed that we had more time than we thought on this drifting road trip, a whole day to be exact. Five individuals lost track of an entire 24 hours of time when loosely scheduling our itinerary over the past couple days. We stuck it in our back pocket, sure to be exploited in the near future and continued on our way. 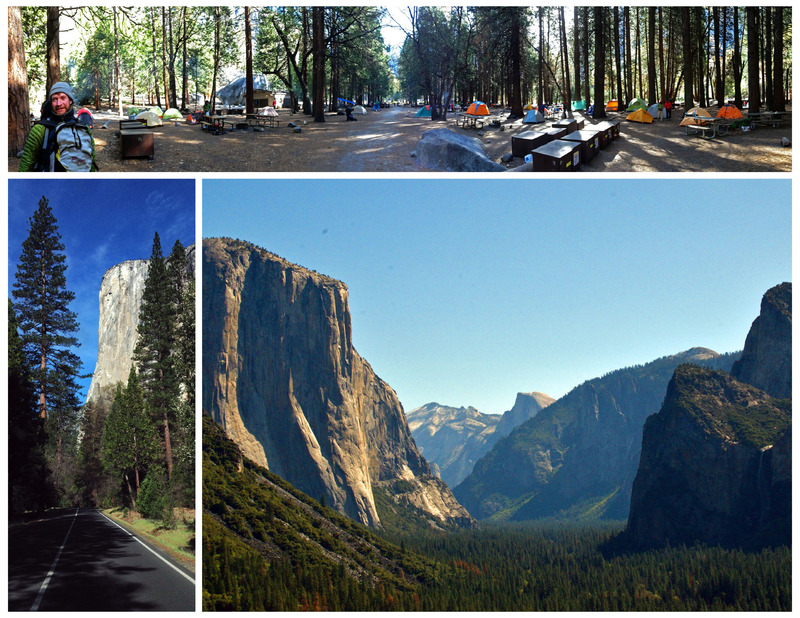 We drove the long road into the Yosemite Valley and the signature granite walls grew larger the deeper we ventured on our way to the only camp inside the park with a first come first serve permit system. Camp 4 is a shaded swath of land near Yosemite falls and El Capitan divided up into a simple grid by half buried horizontal concrete pylons. It has one communal parking lot, requiring walk-in access to each square site complete with 4 bear lockers and a maximum of 4 tents or 6 people. Camp 4 is the antithesis of a wilderness camping experience and is more akin to an open air hostel. Starting as a post World War II hang out for rock climbers, this transient tent city has a long history of hosting climbers from all of the world that come to live here for weeks and even months at a time while they live out their dreams climbing the enormous walls that surround the Yosemite valley. We pay the 6 dollar per person (per night) fee and lug all of our camping gear to the opposite side of camp, passing a mixed demographic of unkempt yet well outfitted men and women that all seem appreciative just to be here, we fit right in. We find a partially available square to share with a couple Frenchmen who are spending a few nights here before continuing on bikes through California. The nearby bathroom with flushing toilets was a luxury, even if the sinks were usually occupied with someone washing their feet next to another who is washing their dishes. It appears as though our stretch of relative solitude found in the sparsely populated east side of the Sierra had come to an end and we assimilate into the camp 4 community through shared Whiskey and Pate with our French comrades. In an effort to save time the next day I suggested we make the 90 minute round trip up to glacier point at night to miss the crowds and get a unique perspective from one of Americas most photographed viewpoints. 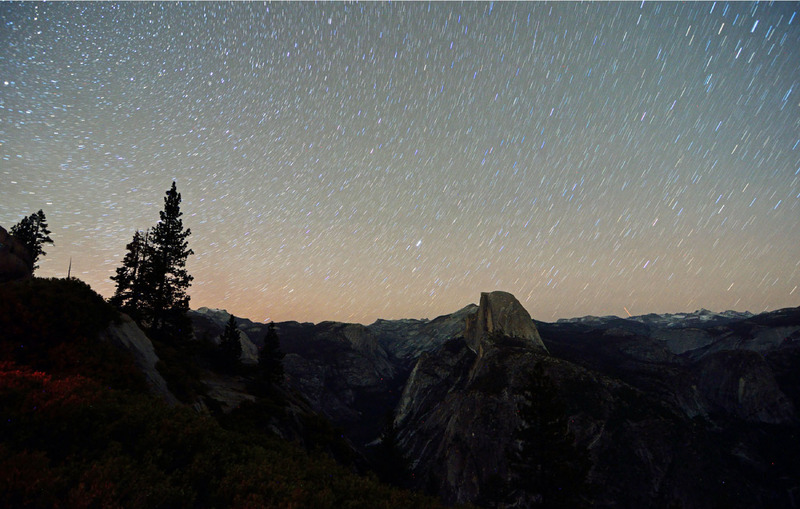 The road to glacier point is one of the most circuitous routes I have ever driven and began to regret doing it at night. That regret doubled when we all climbed out of the Tahoe at the view point and were confronted with a wall of black. The lack of ANY ambient light and a moon rendered the landscape an impermeable black. Even the couple photographs I snapped at extended 4 minute exposures were much darker than expected. We disappointedly climbed back into the truck for the long, winding road back to camp 4 and were serenaded to sleep by drunken ukulele cover songs emanating from a near by camp. I wish I had those ear plugs I thought about bringing. An early exit from Camp 4 allowed us to take the long way out of the park, stopping intermittently to check out Yosemite falls and El Cap where we watched climbing teams wake up on their portal edges, thousands of feet up and partway through multi-day climbs. One last stop at a pull out left us with a postcard view straight down the valley with Yosemite National Parks two iconic landmarks rising on opposite sides of a deeply carved valley. 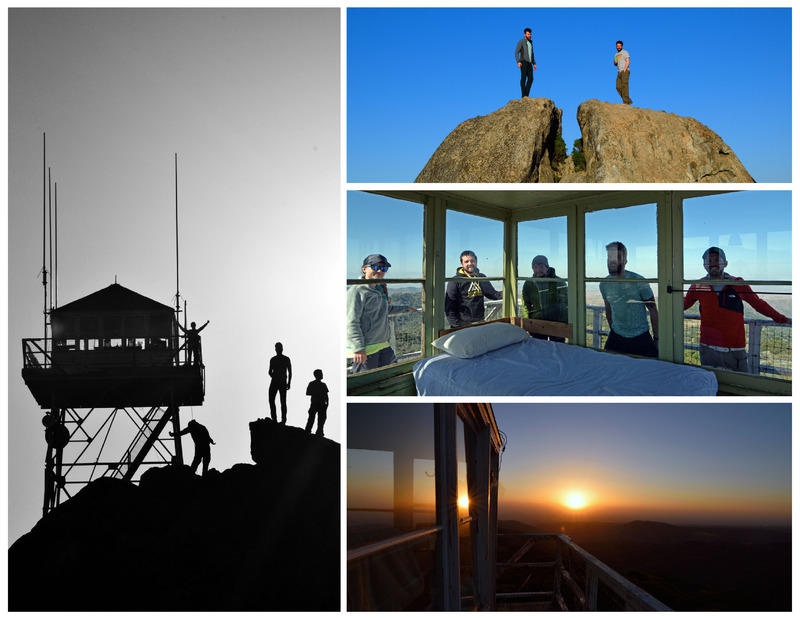 The day before we had exploited sporadic cell service on the road to beat the slim availability odds and secure a fire lookout tower in the southern tip of Sequoia national forest which was our evening’s destination. As we followed the turn by turn directions from the confirmation e-mail we passed through green orchards set against brown sage brush hills, strikingly similar to our home back in Yakima. The road turned to gravel and crossed over cattle grates onto privately owned land slowing us to a crawl as irritated cattle sauntered out of our way. We gained elevation dramatically on the increasingly narrow and winding road as individual miles ticked off much slower than anticipated. After 16 miles we made the only turn called for in the directions and found ourselves bouncing around in the Tahoe on the equivalent of jeep trail. A vehicle with any less clearance than our full size SUV would have become hung up and stuck on the tall berms that cut across the trail road. We arrived at the end of the trail and parked near a little sign that pronounced our elevation to be just under 5000 feet above sea level. We eagerly abandoned the car like little kids getting dropped off at summer camp and scattered in different directions to explore our surroundings. 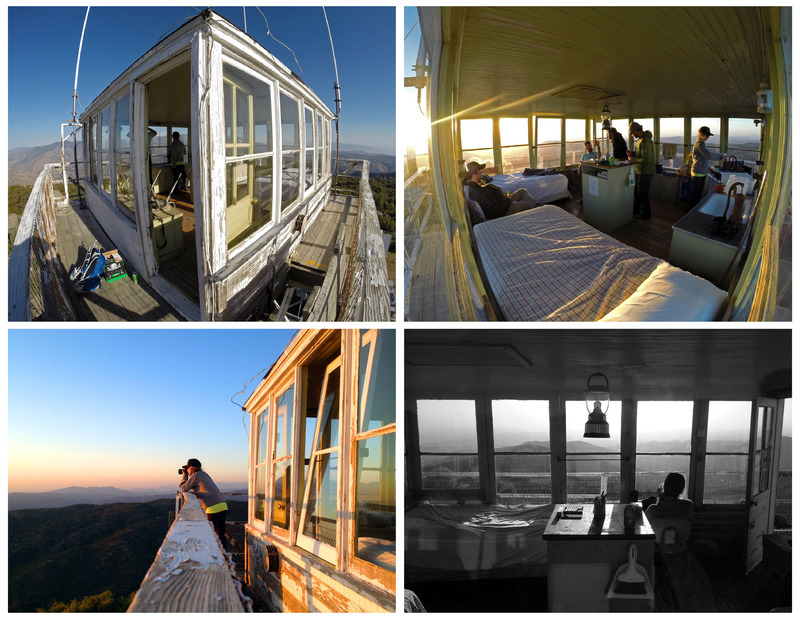 At the highest point of the rocky knob stood our evenings accommodations, an 80 year old steel fire lookout tower, decommissioned in the 80’s and rented out by the forest service on a nightly bases. We one by one climbed the 40 abnormally steep steps, passing the trussed steel support structure before squeezing through a trap door up onto a narrow catwalk that bordered a glass box. It is hard to explain the atmosphere at the moment but imagine attending the ultimate sleep over at the ultimate tree house with some of your best friends when you were 5 years old. Our very own room in the sky combined with the impending sunset set the stage for one of the most memorable evenings I’ve ever had. 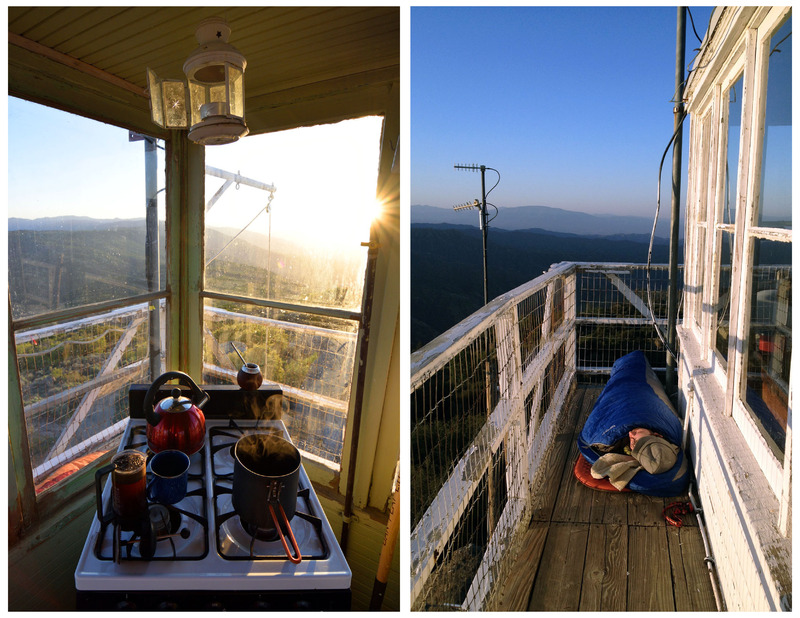 The tower had a rudimentary rope and basket lift system that allowed us to hoist our beer and gear to our loft in the sky and we idled away much of the sunset swigging beers and reading the tower journal entries out loud. Previous authors included excited children, paranoid stoners, witty poets and a sizable sampling of people terrified of a supposed earwig infestation of epic proportions. We saw no earwigs and lit a few candles and lanterns to provide dim task lighting after the western glow dissipated and we went about individual tasks in an attempt to create a feast. 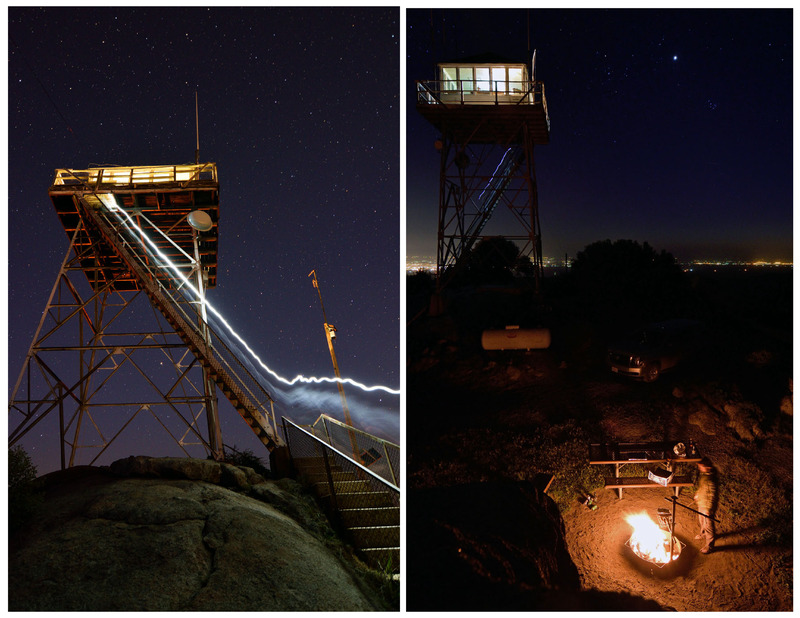 Neil pulled off a delicate appetizer of steamed artichoke and butter sauce in the tower while Brad cooked an array of meat on the bon fire below and Samantha crafted a full pan sized pizza in the propane oven. We ate like royalty and it wasn’t long before we were seeking out surfaces to rest our heads. 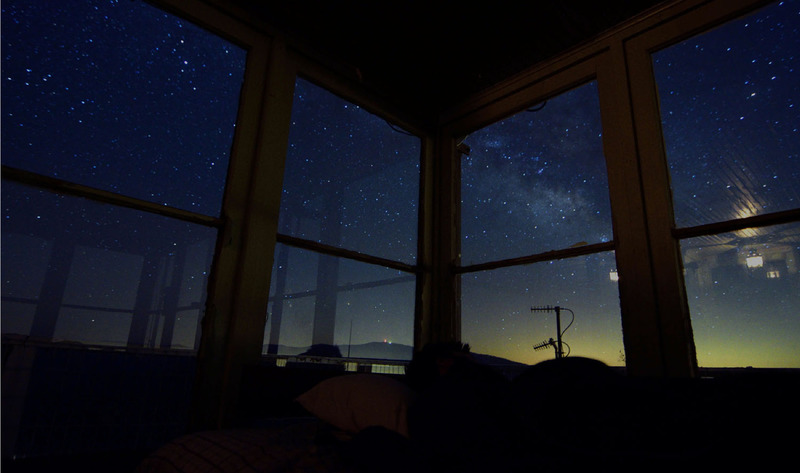 Sam, Drew and I snagged the corner beds, surrounded by stars while Neil and Brad chose to sleep on the open air catwalk. The tower was one of the first things that the morning sun contacted and it warmed our glass room significantly. For the first time in the Sierra, getting out of the sleeping bag was an enjoyable experience and we enjoyed a lazy morning of coffee and eggs while consuming our way through a few Champaign bottles worth of mimosas, drank from miss-matched and unwashed camp mugs. 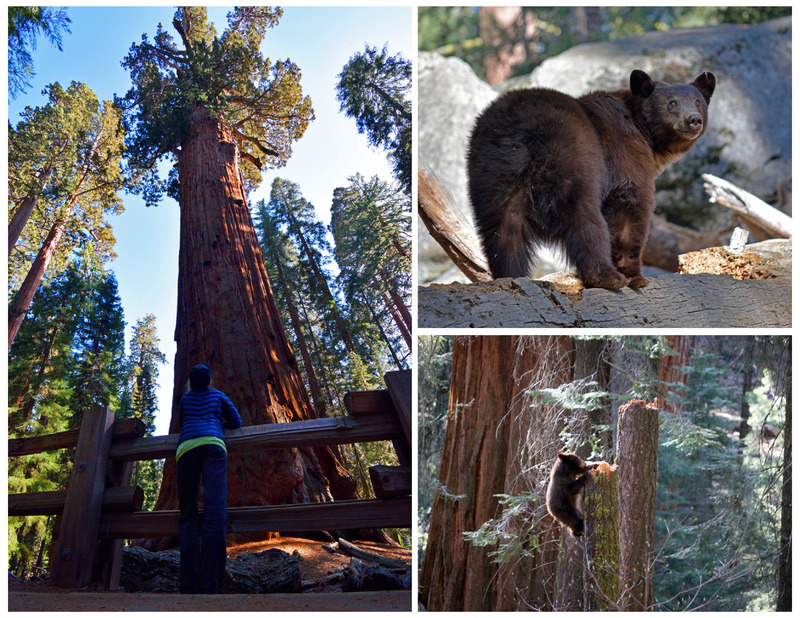 Today was our last day in the Sierra and it was integral that we pay a visit to the giant groves of Sequoia with Neil. The importance of this deed stems from more than one failed attempt at finding giant conifers, most notably a rather humorous Neil-led multi-day voyage into rural Chile in search of the rare and elusive giant Alerce tree. While there we trekked passed an enormous 4000 year old Alerce stump which only heightened our expectations that were later deflated when the grove of living Alerce, albeit very old, were smaller than the large spruce tree we used to climb in a friends front yard in New York state. To add to that, last years Mt. Shasta Summit trip was to include a visit to the coastal California redwoods but that opportunity fell to the wayside as we ran out of time on the road trip. 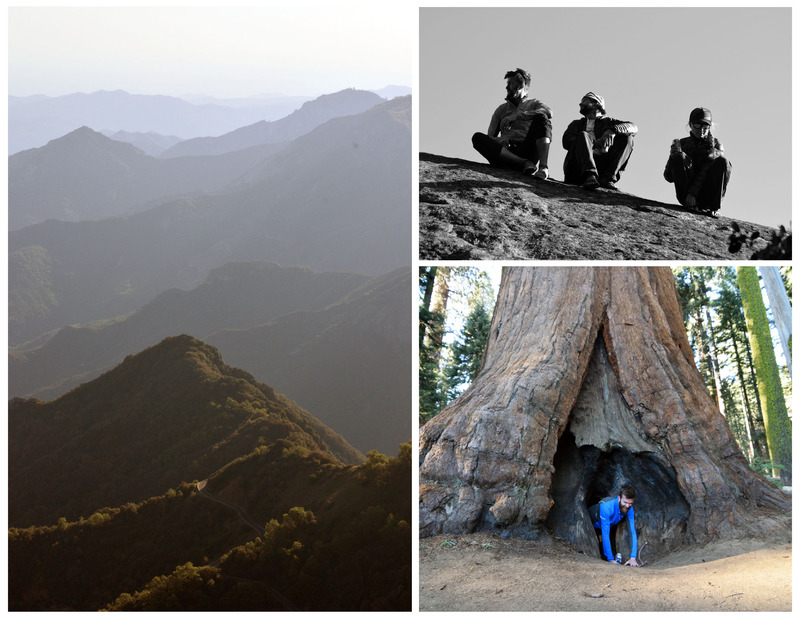 So this was it, our chance to finally pay a visit to some really spectacular trees and into Sequoia national park we drove. 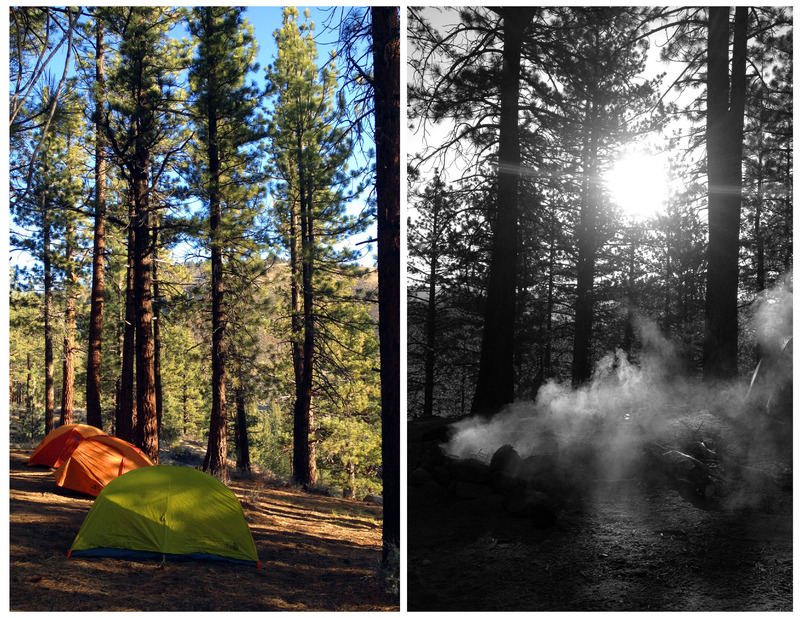 We stopped into the parks lowest elevation camp and set up tents before continuing deeper and higher into the park. I was caught off guard by the rugged landscape that required yet another tight serpentine road to traverse along steep cliffs. What I had envisioned as a horizontal landscape covered in looming sequoia trees was actually much closer in appearance to the Andes mountains, with steep peaks and deep canyons covered in green vegetation and trees. Finding the General Sherman tree was a much easier process than our Chilean Alerce exploration and a short walk from a parking lot situated us under the largest tree by volume in the entire world. General Sherman looks more like the bottom half of a mega tree as its trunk narrows only minimally as it stretched skyward to the relatively small amount of branches and foliage that make up its canopy. We continued on through the nearby groves of colossal Sequoias and steered clear of a bear with her cubs before making our way to a prominent cliff that looked out over the valley towards our campsite, over 5000 feet below. We lingered here for quite some time, drinking cheap beer, observing ant trails, climbing boulders, scanning the vista with binoculars and savoring the waning hours of sunlight. 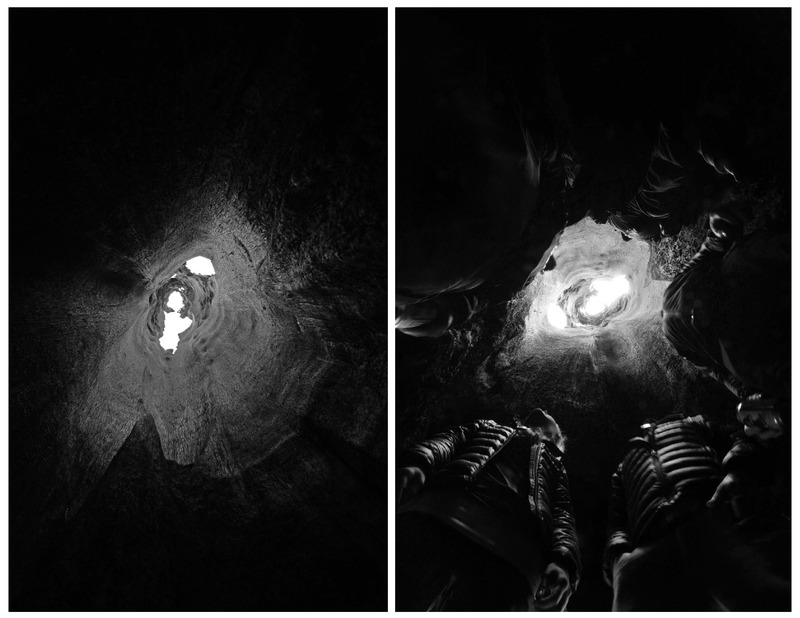 Before climbing back into the truck, a small hole at the base of a fire ravaged sequoia allowed all five of us to crawl INSIDE the tree at the same time and experience the vertical chimney like space in appearance and smell. 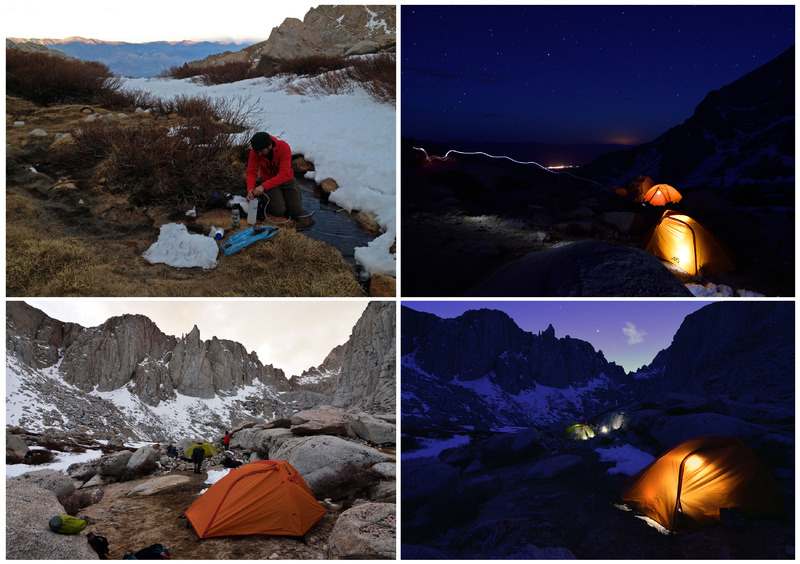 That night marked the end of our time in the Sierra Nevada and I fell asleep in our battered tent feeling a heightened affinity for a mountain range that 7 days prior I only knew through literature yet now felt like a home. As on all of our walks into the mountains I am left feeling fortunate and enlightened. I feel stronger yet more humble. We have absorbed the kind of perspective and insight that only comes through these progressive and transformative experiments with nature and community. The Sierra has shared some of its most beautiful and unique experiences with a few strangers willing to step out, and as we drive back into society we are wealthy beyond our dreams. Great adventure, and great photography! Wonderful photos! Absolutely wonderful. Thanks for sharing this experience with us. Nature or bust! What a joy to read. Thanks for sharing your adventure.